Cute W arrived home from his work conference on Friday morning, which meant we had time to ourselves before the girls got back from school. We decided to go out on a lunch date and try someplace new to us, Slidin’ Dirty. I haven’t ever eaten at the Troy location or the food truck, either, but it turns out that I had gone to Slidin’ Dirty in Schenectady once before, sort of. . . During our crazy GISHWHES scavenger hunt week, I met my teammates there while toting along props to create one of our items, a nightclub for Icelandic fairies in an urban setting, once it got darker. Unfortunately, I ended up having to leave early, before I even got anything to eat or drink, so that I could drive someone somewhere. I handed off the fairy nightclub and they staged it quite nicely later, just outside of the restaurant and looking down State Street toward Proctors. Slidin’ Dirty is tucked away in a slightly awkward location, a bit beyond where most of the commercial-retail stuff is. If you’re familiar with Puzzles Cafe, it’s–Oh, my gosh, you guys, how have I never written about Puzzles here? I am clearly falling down on my duties. I am going to try to do better. Puzzles Bakery & Cafe is the super-good-karma business that employs folks on the autism spectrum in the life-enhancing work of providing baked goods to me and the rest of the general public. Well, and also salads and sandwiches and such. It’s very friendly and includes game nights and special needs events, plus there’s outdoor seating. It is a lovely stop if you need a little something before or after a movie or show, or if you want to follow up your Indian food with a little chocolate. Anyway, if you’re walking away from that core of downtown where Jay Street runs into State Street, up the hill and toward Veterans Park, Puzzles is on your left and Slidin’ Dirty is a bit farther on the right. We wanted to go for maximum smorgasbord to try a bunch of things, so we shared a Slidin’ Dirty Sampler from the munchies and a trio of sliders, the Hottie, the Cowboy, and the Colonel. It was all pretty dang tasty, from burger to bun and everything in between. 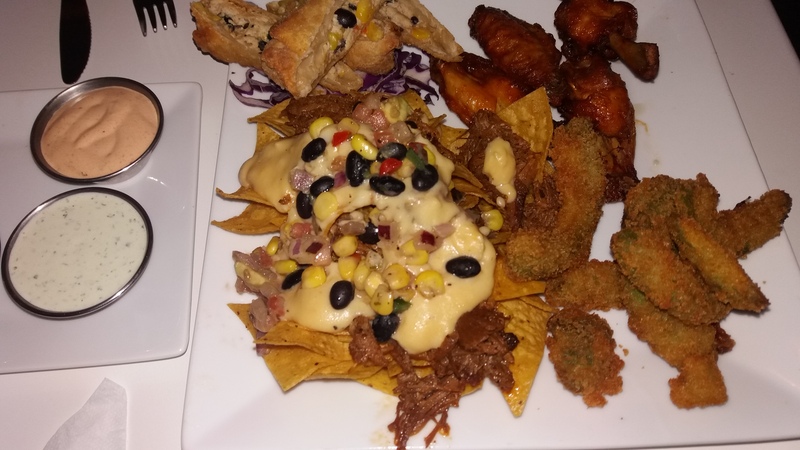 Here’s a picture of the sampler–the Fravos, Panko-breaded avocado slices, were my favorite, the chicken eggrolls were tasty, the wings were better than average, and the nachos were not entirely hot, but also pretty yummy. Generally, it was way better bar munchies than you’ll usually find. I would absolutely go again. On Sunday, Cute W, J, and I biked down to the farmers’ market. We found some local raspberries and peaches, which made us very happy, and of course we ordered ourselves some empanadas, because we pretty much have this problem where we can’t go to the farmers’ market at all these days without getting ourselves some empanadas from Empanada Llama (which we’ve definitely mentioned before). 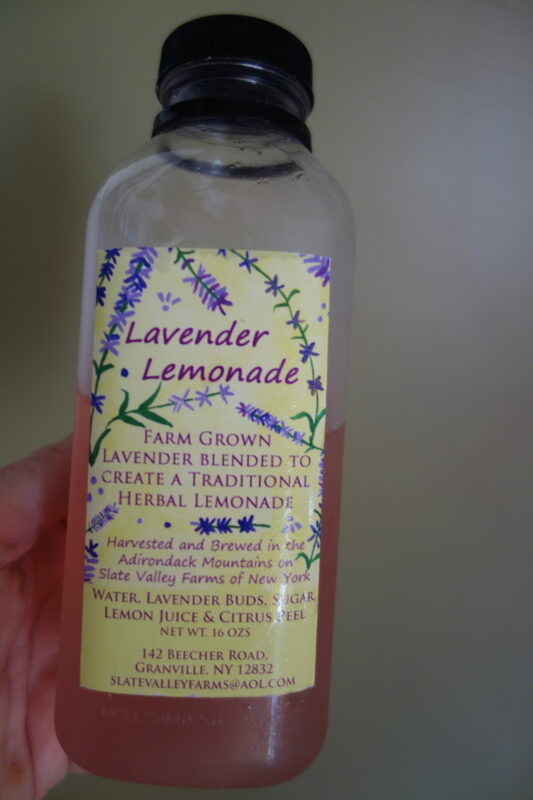 We also tried something new: lavender lemonade from Slate Valley Farm aka Uncle Pat’s General Store. J saw this and she was intrigued, so we bought the bottle to taste. They were on display in a bed of ice, but they weren’t super-cold, which was a bad strategy, because after trying it at the market and thinking “Meh,” I brought the bottle home and refrigerated it and tried it again to discover that it had vastly improved. It reminded us of the evian fruit-and-flower combinations that we’d found in France, which is a high compliment, for sure. I think we may try to replicate this at home.